Beyond Rail: The Transport Capacity Challenge - an OnTrac White Paper. Transport is part of our daily lives. It connects people to their families and jobs, facilitates trade and investment and brings different cultures and experiences closer to us. 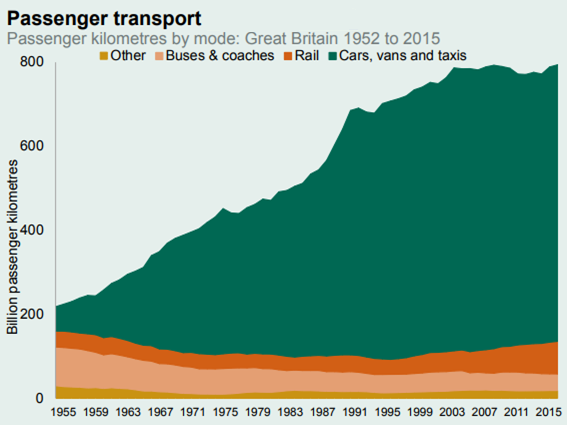 With population growth and demand for travel both increasing, the UK’s transport network is facing unprecedented strain. As technology, demographics and social preferences change, both investment and operational practices must keep pace. 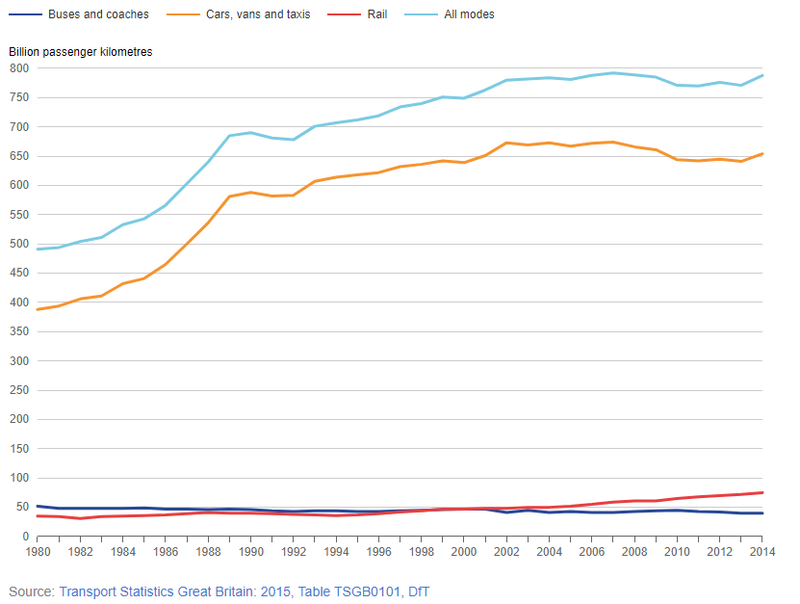 It is not just the rail industry that must address the growing capacity challenge. This article will explore the trends facing the UK’s road, aviation and maritime networks as they creak under increasing demand. Firstly, this article will outline the reasons that have contributed to the current problem of capacity. We will explore the question of ‘Why?’, along with identifying patterns and trends that contribute to the capacity problem. Secondly, we will examine potential solutions, alongside the pragmatic challenges of implementation that each would face. Finally, we will determine conclusions can be drawn that allow actionable steps to be taken for the future. To identify solutions to the UK’s capacity problem, we must look to identify both root causes and measurable trends. An increasing population is an obvious contributor to congestion. The UK population is forecast to grow by 17% by 2050, with London’s growth closer to 35%. The majority of these people will live in cities and their commuter belts. An aging population has led to forecast that the UK’s population of over-65s will soon double. In addition to increased capacity, transport mobility spending must increase to meet demand. As an international centre for trade, the UK is witnessing considerable demand from visitors and economic migrants from around the world. In 2015, there were 36.1m visitors to the UK from overseas, with UK residents taking 65.7m visits abroad. The transport of goods also puts pressure on the UK’s road network, with the number of goods vehicles on the roads doubling since 1995. Our increased prosperity comes at a cost as the toll on the transport network begins to bite. Behavioural patterns across young adults are changing. Today’s young people are more likely to remain in further education into their early 20s, along with delaying traditional rites of passage into adulthood such as home ownership, marriage and children. This, in conjunction with the rise in budget airlines and accessibility of foreign cultures, has led to an increase in the number of leisure trips. As a result, the UK’s airspace is close to full capacity. The rise of climate change is forecast to significantly increase the number of extreme weather events. This will severely test the resiliency of the UK’s transport infrastructure. Recent floods have caused significant infrastructure damage in North-West England. The ancient city of York has recently experienced major flood damage. The collapse of the sea wall on Dawlish’s picturesque coast in February 2014 saw memorable images of storm damage to the track bed. Congestion will be worsened as transport alternatives become temporarily unavailable due to extreme weather events. Because of rising demand, commuting patterns have seen significant changes over time. Many of the trends seen on roads are different in London to other areas of the UK. Whilst the number of miles driven by car has increased significantly over the past 20 years, the average number of car journeys per person has surprisingly decreased. It is likely that the 2008 economic recession, improved public transport and the trend of younger people delaying traditional rites of adulthood are responsible. Despite this, the Department for Transport’s National Transport Model predicts continuing growth in car mileage per year. It is important to consider that the reduced mileage per car does not indicate an overall reduction in total journeys taken. Rather, these individuals are using alternative means of transport. This leads to congestion elsewhere on the network. Congestion ‘pressure points’ within cities will continue to see steadily increasing demand without further action being taken. The number of both light and heavy goods vehicles on the roads has steadily increased. This is fuelled further by the popularity of online shopping. The use of buses has declined significantly at a national level. The reverse is seen in London; likely a result of a growing population, congestion zone charging, the introduction of Oyster cards, cross-transport integration and TfL subsidies for less-profitable routes. London provides evidence of a future trend. This is likely to be replicated in cities such as Birmingham and Manchester should similar social change and policies be introduced. London has seen an increase in the number of cycle journeys after significant infrastructure investment. However, growth has been largely flat nationwide. This is unable to ease the UK’s capacity problem in isolation. 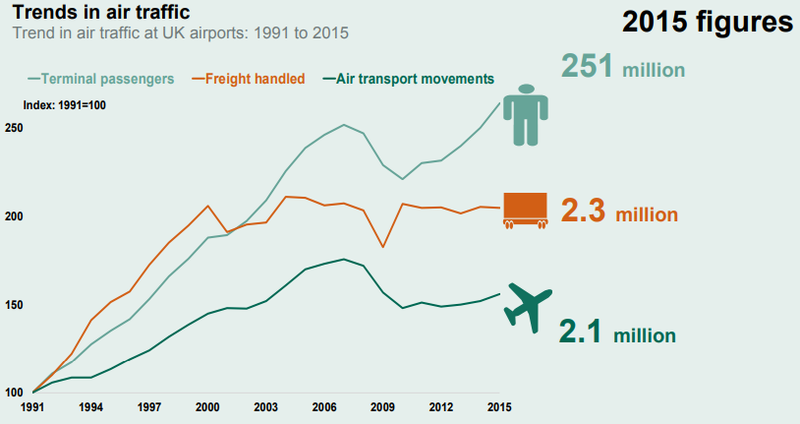 The number of passengers travelling through UK airports has almost trebled in the past twenty-five years. This is driven by the availability of affordable leisure flights. The UK government faces considerable political pressure from numerous stakeholders regarding the decision around building new runways at major airports such as Heathrow. In a post-Brexit Britain, trade with non-EU nations will be of greater importance. UK airspace must therefore adapt to meet these capacity demands. It is not just land-based means of transport that are reaching capacity limits. It is expected that global maritime trade will double by 2030 as developing countries expand their merchant navies. This will create a shift in freight patterns and put further pressure on capacity limits. 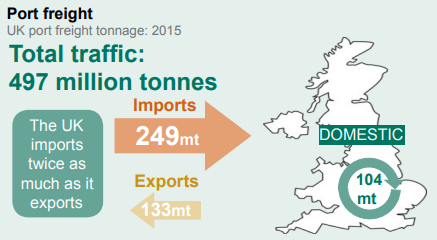 The Dover Strait is the world’s busiest shipping lane, with 500 – 600 ships per day passing between the UK and France. Cargo varies from goods travelling to and from major deep-water ports such as Rotterdam and the Port of Tyne, alongside commodities such as oil and gas from the Middle East. Ship size is also increasing. This is largely driven by the expansion of the Panama Canal in 2015. Developing ports to handle these ‘New Panamax’ ships will require significant capital investment to increase capacity limits. Developing solutions to the capacity problem is a critical challenge. With an increasing load on transport infrastructure, it is essential to push towards a decarbonised transport infrastructure based on sustainable energy use and production. Greenhouse gas emissions from transport are a target of both national and international policy. The negative externalities of transport are not accounted for in the market system. Thus, there is little incentive to encourage a capital-intensive move towards environmentally sustainable practices. The UK government has recently made a commitment to ban the sale of diesel and petrol cars and vans from 2040. It is estimated that poor air quality resulting from emissions costs the UK £2.7bn annually in lost productivity. This commitment includes local funding for traffic light reprogramming to improve traffic flows and reduce emissions from stationary vehicles. As public health and climate concerns increase, further market-changing incentives are likely to be introduced in future. A shift towards decarbonisation of transport will likely lead to a long-term increase in the price of steel, copper and battery-grade lithium. Left unchecked, this would lead to price inflation for electric vehicles. Tesla CEO Elon Musk is leading the drive to address this via the construction of numerous ‘Gigafactories’. 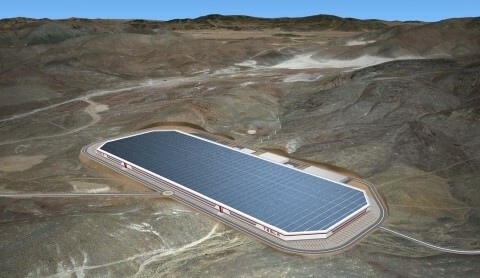 Tesla expect the economies of scale resulting from the Gigafactory to reduce battery production cost by 35%. Through use of vertical integration, Tesla expect to achieve the inflection point at which it is cheaper to build an electric powertrain than an internal combustion equivalent by 2020. Musk believes that all transport, apart from rockets – due to Newton’s third law of motion – will ultimately move to electric power. The prospects of decarbonising shipping and aviation however remain bleak in the near term. Many more Gigafactories will be needed to facilitate global decarbonisation of transport. 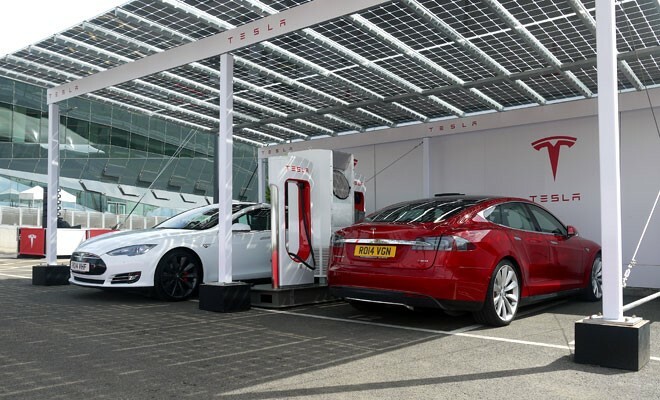 The UK’s charging infrastructure requires major expansion. Critics argue that electric vehicles simply shift carbon emissions from a vehicle upstream to the power plant. However, economies of scale at the power point level are much more efficient than at the unit vehicular level. This results in lower emissions throughout the lifecycle of energy production and use. Power-generation via solar and integrated battery pack storage will reduce emissions further, alongside the use of wind farms and other non-coal driven forms of energy. Unless addressed, the risks of climate change will significantly increase. Capacity thresholds must be made resilient against disruptive weather events. It has widely argued that transport planning and processes must be more integrated. Often technology is introduced as an intended ‘silver bullet’ to the problems of capacity. However, processes must first be in place to offer the essential platform for technology to succeed. By using an integrated approach between different means of transport, journey times can be reduced and city planning delivered in a way that either reduces peak demand or can cater for increased capacity. As a secondary effect, increased support for both cycling and walking encourage positive health externalities. One survey estimated that the number of journeys made by walking has fallen 30% in the past 20 years. By using these integrated approaches and providing incentives, walking and cycling can help ease demand by redistributing load elsewhere across the transport network. Local ticketing systems, such as London’s Oyster card system, incentivise the use of multiple forms of transport for a single journey. This can be difficult to achieve without a single overriding authority such as Transport for London. Through greater political devolution, it may be possible to expand such schemes elsewhere. Only once working processes are in place can technology truly flourish. The use of smartphones, GPS devices and digital ticketing result in the creation of massive datasets. This can be used to improve transport planning and capacity management, including the ability to make decisions in real-time. Cheaper sensor technology also addresses the engineering challenge, alongside the software challenge. Tracsis’ Traffic and Data Services division enables transport planners to capture vital traffic survey data. Complemented with advanced data visualisation, the speed and effectiveness of decision-making is improved to help manage transport capacity. Tracsis’ approach includes support to develop the critical dependency for technology to succeed; a suitable process. The development of new methods of transport is an exciting possibility. Trials of automated vehicles by companies such as UBER, Google and Tesla raise the potential of fleets of vehicles that operate more efficiently. The future of those working in industries affected by automation, such as heavy goods vehicles, must also be considered. In the US, road haulage is the most common profession, employing 3.5 million people. Autonomising this fleet would lead to predicted savings of $168bn annually. Savings would come from labour, fuel efficiency, productivity and reducing accidents. This would come with a tremendous social cost which must be addressed. These changes would not happen overnight. The lifecycle of a vehicle is approximately 15 years, meaning there will be a lag in both electric and/or autonomous vehicles entering the transport network. Capacity alleviation would therefore be gradual in the absence of governmental incentives. Other proposed solutions, such as Hyperloop, drones and improved tunnel boring techniques, are currently at a conceptual stage. 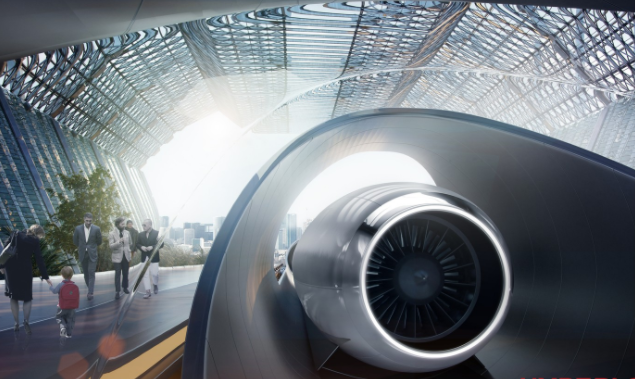 A proposed vacuum-tube design, Hyperloop’s promise comes from transporting passengers at speeds of up to 600mph. This considerably faster than either rail or air, which both face significant capacity challenges. Hyperloop would only be suitable for long journeys due the speeds achieved and the time taken to accelerate and decelerate the capsule. Given the early stage that such technology exists, it will face numerous engineering, technical and legislative challenges in the coming years. This makes its potential to alleviate capacity challenges difficult to quantify. The Boring Company’s attempts to ease congestion through tunnelling are also at a conceptual stage. By making transport three-dimensional rather than two, an order of magnitude improvement in tunnel boring speed would increase road capacity tremendously. This would be facilitated using electric vehicles, reducing emissions within the tunnels to acceptable levels. Like Hyperloop, this is at an early engineering stage and it is impossible to quantify accurately its ability to increase network capacity. The use of drones to deliver light goods is also at an experimental stage. Amazon’s efforts to use autonomous drones in place of road vehicles have encountered political opposition. Drones must also be tested under challenging weather conditions, carrying various payloads and managing power consumption. Theft may also prove a problem, alongside concerns around violation of private property rights. Alternatives to transport itself must also be considered. Skype and alternative teleconferencing techniques are widely available and facilitate communication and collaboration between users at different locations. In the future, the use of both augmented and virtual reality may limit further the need for physical transport by replicating environments and experiences within a digital space. Fifty-seven percent of those surveyed prefer face-to-face communication where possible. VR meetings allow for the introduction of nuanced non-verbal communication that is either limited or not possible at present. This includes eye contact and subtle cues such as interpersonal distance and body language. Over time, both smell and touch are a possibility. At OnTrac, we are investigating the use of both AR and VR to improve worker safety in dangerous and hazardous environments in the rail industry. The potential to use this for other industries is immense. 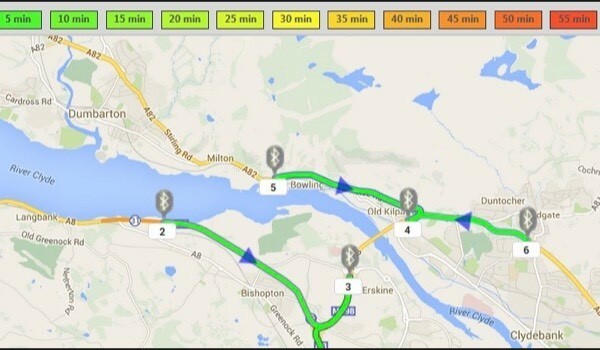 New technology may well to reduce the need for physical journeys; acting as a relief on network capacity. The pressures of limits to network capacity are not constrained to the rail industry. As we’ve seen, the UK’s road, aerospace and maritime infrastructure are all facing capacity pressures. We must not only meet both the engineering and software challenges – but also acknowledge the incredible political, economic and social pressures at play. In Joshua Ramo’s recent New York Times bestseller ‘The Seventh Sense’, he articulates the challenges that networks of all kinds will bring in the digital age. This includes the capacity for more widespread disruption due to the interconnected nature of a network, alongside new vulnerabilities that must be addressed. At a time of increased fears around cybersecurity, the use of technology to disrupt transport will grow. This will be particularly prevalent in an age of artificial intelligence and autonomous vehicles. Manually resolving a ‘black swan event’ under these circumstances will mean disentangling a level of complexity not yet seen. Solving the capacity challenge will require collaboration between both public and private organisations to marry cutting-edge technology with the syndication of risk from disruption. At OnTrac and our parent group Tracsis, we are committed to using our skills in process optimisation and technology to deliver solutions across the transport industry that address the capacity challenge. We understand that each industry and organisation face their own operational risks. We design and optimise our solutions with context in mind. 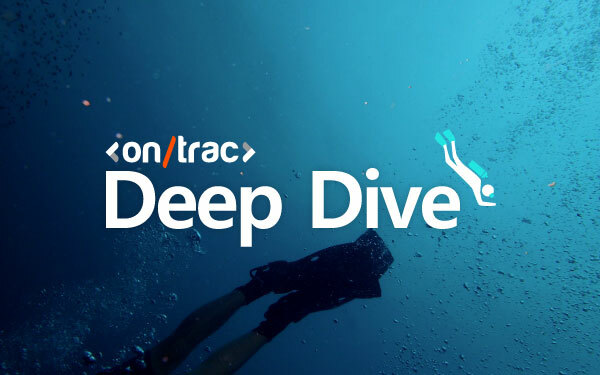 Both OnTrac and Tracsis are on the cutting-edge of delivering solutions to meet the capacity challenge. Overcoming the challenge of network capacity is a journey that must be made. The means of travel are yet to be decided.